Honey is one of the most amazing foods we enjoy today. Its exquisite texture, varying colours, and differentiating tastes make it truly a wonder of nature. In recent years, honey has been investigated for use in scientific medicine. However, scientists are baffled at certain properties of honey, and are at a loss to explain the undoubted benefits gained by human’s eating nature’s golden wonder. Even though scientists and dieticians cannot explain why honey is such a remarkable food, they can acknowledge the benefits it can give. Here are a few examples of using honey for medicinal purposes in our every day lives. FOR INFANTS OVER ONE YEAR OLD: use honey as a sweetener to give the infant supplementary minerals and help calcium retention. SLEEP: To combat sleeplessness, stir one teaspoon of honey into a cup of camomile tea with your evening meal. DIETING: Use honey as a sweetener where ever possible, because it does not result in an increase in body fat as refined sugar does. If you are trying to lose weight, reduce your portion size and take one tablespoon of honey after a meal to give a feeling of fullness. COUGHS: To help sooth an irritating cough, mix one cup of boiling water with 2 teaspoons of honey and 2 lemon slices. Sip slowly to bring relief. DIARRHOEA: A sure cure for diarrhoea is to mix one tablespoon of honey with 200 mls of barley water. Drink half a glass when necessary. LAXATIVE: Honey has a natural and gentle laxative effect. 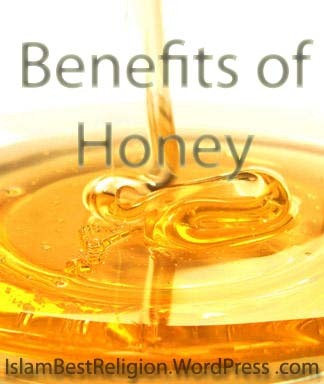 Take one teaspoon of honey each morning to keep yourself regular. BURNS: Honey is an outstanding remedy for burns. Apply pure honey directly to open flame burns or steam burns and burns from hot objects. It alleviates the stinging and helps to stop the development of blisters. It will help to prevent infection and assist in swift healing. MOUTHWASH: Due to its antiseptic properties, honey makes an excellent mouthwash. Mix one tablespoon of honey with a cup of water and two tablespoons of cider vinegar. Honey is good for the memory, has antibacterial and antifungal properties and wound healing and anti inflammatory properties. Honey should be used in place of refined sugar with young children and the elderly as it is less strenuous on the digestive system. Honey digests easier then sugar because it has already been digested in part by the honey bee. SubhanALlah there are so many Islamic miracles but we dnt see Allah is great !